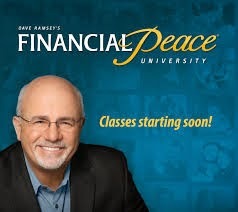 Financial Peace University (FPU) is Dave Ramsey's life-changing program that teaches you how to achieve your financial goals by eliminating debt, saving for the future, and live like never before...debt-free! Cost $93, includes Lifetime membership to FPU (attend refresher courses anytime for free), FPU Kit: 9 Video-based Lessons, Workbook, Complete Guide to money, online Budgeting tool, Video & Audio Access,and Small Group Atmosphere. If suggestions are followed, this class is guaranteed to relieve your financial stress, and "change your family tree!" For more information, call Pastors Bill Gallahair (334-202-4985), or Dave Hicks (334-201-0195); HFCC, 4280 Deatsville Hwy, Deatsville, AL 36022.